Vuetec began in Sydney, Australia in 1999 with the aim of providing a live video feed for online gaming enthusiasts. The first live feed was achieved using dial up at 56kbps long before technology was ready for a live dealer casino. Today, the majority of live dealer casinos online offer a stream from a studio set up specifically for online gaming. Vuetec takes a different approach, as you’ll be playing live at a table in an actual casino. Vuetec owns both Lucky Live Casino and Dublinbet and offers their live dealer roulette experience from these sites. Vuetec’s focus is on partnering with many online casinos around the world which would like to offer the bricks and mortar experience into people’s homes so they can play for real money. Currently, you can play online at two brick and mortar casinos. Fitzwilliam Casino in Dublin and the Palace Casino in the Isle of Man both offer Vuetec casino live dealer roulette mixed with real players. You’ll see real players as the games being played in a real as well as online players playing at the tables. This means that the speed of the table is governed by the actual casino and not by the online players, giving the live dealer experience added authenticity. The Vuetec’s set up is adaptable to any bricks and mortar casino, with strategically placed cameras offering blind spots for the real players who would like to remain anonymous. One downside is that the roulette live stream is not as crisp as you might find at a dedicated online casino – the studio set up offers the right lighting for an ideal stream that you’ll not get at an active brick and mortar set up. When entering the live casino you will be greeted with the choice of tables. Currently, the tables at Fitzwilliam Casino are available at all times and the tables at the Palace Casino available daily from 6 pm to 3am (4am on Friday and Saturday). Clicking on your table of choice will take you to the Live Casino. 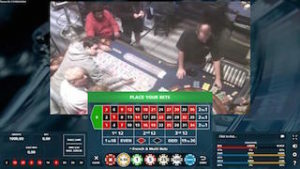 You’ll be presented with a window showing a large betting grid covering the bottom half of the screen, with the roulette live stream being shown in a smaller window above this area. Before the spin, the stream will concentrate on the whole table, but when the wheel is put in motion, the focus turns to the wheel, with a close up of the wheel as the ball slows down and hits the slot. In the top right-hand corner of the screen, you’re given the option of favorite bets, autoplay and the stats from the table, with information about the table in the top left-hand side. Being a real casino there is no chat option, however, there is an option to tip the dealer if you do have that big win. Other options include changing the color of the felt in the Virtual betting area and altering the sound settings. Another key difference between Vuetec and other operators are the dealers. It wouldn’t be a lie to say that many of the other live dealer companies employ many of their staff based on their looks, with the majority of the staff being females under thirty years of age. Vuetec takes a completely different approach. The dealers are professionals and are recruited based upon their ability, with an understanding of the game and the players playing the game, making for a more authentic roulette experience. For example, you could play two tables of live dealer roulette as well as two games of live dealer blackjack at the same time – moving from game to game by hitting the tabs at the top of the lobby. You’ll also be able to use play money at Vuetec casinos, a great option if you want to gain a feel for the game before investing your cash to play live dealer roulette for real money. The rules at Vuetec live roulette are governed by the casino featuring the games. Currently, all of the tables on offer play the European roulette which features just one zero. This means that you’ll receive better odds than you would at an American roulette table where two zeros feature where the house edge is 5.26% versus 2.7% in European roulette. Looking into the future, conceivably you could visit any online casino in the world using its technology, which would be an exciting prospect for someone who would like to experience gambling in Las Vegas. Currently, the stream is not as good as you’d find in other live dealer offerings; however this could easily change as the technology improves. As well as live dealer roulette, Vuetec also offers variations on Blackjack and Texas Holdem as well as Baccarat in the live casino.